You hear it time and time again – do not take your problems to Twitter. Chances are you’ve thought about this while backspacing your latest complaint, but it’s surely something that should be taken seriously in the business world the same. Perhaps big-time CEOs should take this advice, too? 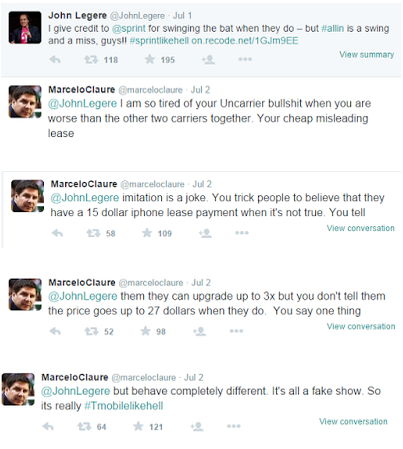 Sprint and T-Mobile CEOs, Marcelo Claure and John Legere, engaged in a Twitter fight on Thursday after @JohnLegere tweeted his honest, negative opinion of Sprint’s latest campaign, #Allin. Imagine how Claure’s PR people acted after this tweet came in late Thursday night? Nightmare. An hour later, Claure responded from his own personal account, though the initial tweet did not tag @Marceloclaure, but the @Sprint company account. He tweeted a lengthy response, using four posts. All Lohn Legere tweeted back was “u mad bro?” Well, obviously these two do not get along, but it’s always interesting to see high-level executives, or the highest in this case, displaying it so publicly! In the world of media, it’s always something to talk about when millionaires have their Gossip Girl moments. What are the PR implications here? We never want to see our clients on social media in a negative light. If it can be avoided, then make sure to avoid it. But Twitter emphasizes the freedom of speech, so there are moments of controversy. Implement a social media campaign to ensure that the client understands what is beneficial to post on social media.